Anemia can result in various health problems. 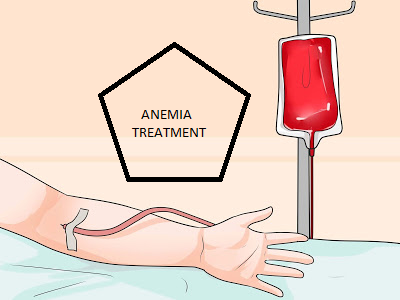 Anemia is a condition where your body doesn’t get enough healthy red blood cells, in other words when they don’t carry enough hemoglobin, or when these cells don’t do what they are supposed to do. Red blood cells are responsible for bringing oxygen to our body and removing carbon dioxide from it. If these processes don’t work properly, we get poisoned by carbon dioxide. Having anemia may make you feel tired and weak. Symptoms may include fatigue, skin pallor, shortness of breath, light-headedness, dizziness or a fast heartbeat. There are more than 400 types of anemia, which are divided into three groups: Anemia caused by blood loss. Anemia caused by decreased or faulty red blood cell production. Anemia caused by destruction of red blood cells.The causes for this can vary, and so can the treatment. The causes of anemia can be very different. Of course, we all get tired and fatigued every now and then, but if most of these symptoms can be applied to you, it’s worth checking it out. When our body doesn’t get enough oxygen or suffers from a reduced number of red blood cells, our skin changes color and we look very pale. This applies not just to the face but the entire body, especially the hands, the inner part of the lower eyelids, and the tongue. Low levels of hemoglobin make the heart work harder than normal to pump blood through our system, it has to work extra hard trying to give us enough oxygen which could result in an irregular heartbeat. If our organs don’t get the right amount of oxygen, our body has to work much harder to produce enough energy for everyday functioning and this makes us feel very tired and fatigued. All of our organs need oxygen to function well and the brain is no exception. If the oxygen level is lower than what is needed, we can’t think clearly and suffer from poor concentration and focus. Most of us get dry or cracked lips sometimes from wind, sun, or cold temperatures, but anemia causes specific areas of cracking, which affects the corners of the lips. Scientists don’t have an explanation yet for why anemia causes these weird cravings, but the most common ones are cravings for dirt, chalk, or ice. There are many types of anemia and the treatment will differ depending on what caused this condition. 1. Improve stomach Acid Levels. When our stomach doesn’t produce enough acid, our body cannot break down the food to the required degree and this might cause the malabsorption of minerals and vitamins, including iron and vitamin B12. You get enough nutrients with your food and supplements but it just does not get into your system. Low acid levels can also get to the point of giving you something called a leaky gut, because food doesn’t get digested properly and it irritates the gut lining. Leaky gut is a condition in which the small intestine lining gets damaged. When this happens, undigested food particles and toxins can get through the intestines and into the bloodstream, causing various health issues including anemia. Most of the time leaky gut is caused by an unbalanced diet, therefore, the best way to fix it is to change what you eat. Food sensitivities can irritate the digestive system and be responsible for causing leaky gut. Avoiding any food intolerances will help to get it healed. Folate is a form of vitamin B9 and plays an important role in many functions in our body, including building healthy red blood cells. Vitamin B12 is also an essential element of healthy red blood cells. Vegetarians, vegans, and pregnant women may be at higher risk of a vitamin B12 deficiency. Iron is one of the elements that is essential for our body to function properly. It’s a key mineral for red blood cell production and its deficiency is very likely to cause anemia. There are 2 ways to increase iron intake — through supplements and food. Treatment depends on the underlying diagnosis. Iron supplements can be used for iron deficiency. Vitamin B supplements may be used for low vitamin levels. Blood transfusions can be used for blood loss. Medication to induce blood formation may be used if the body’s blood production is reduced. Disclaimer: We are certainly not qualified to give any diagnosis. But if these symptoms apply to you, maybe it’s a good idea to see a doctor and get yourself checked.